Sunnat Ibrahim has established himself as an artist of creativity, passion and technical command. He is one of the most prominent cellists to emerge from the Central Asian republics and has studied with many of the top artists of our time. He has performed live and on radio with major soloists, chamber musicians, orchestras and conductors. He performed with orchestras (“Soloists of Uzbekistan,” Uzbek National Symphony, Kansas City Symphony, Des Moines Symphony, Omaha Symphony, Shenyang Symphony), chamber musicians (Shmuel Ashkenasi, Borromeo String Quartet); festivals (the Orford Music Festival in Montreal, Aspen Music Festival) and has worked under such prominent conductors as Carl St. Clair, Gerard Schwarz , John Nelson, Hugh Wolff and Robert Spano. In 2017 as a cello fellow he performed with the Aspen Festival Orchestra under Joshua Weilerstein. 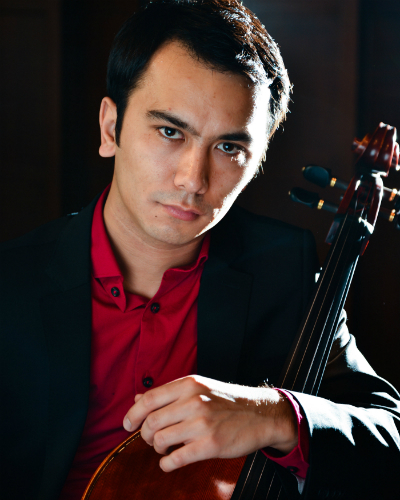 Born in Tashkent, he began the cello at 7 and studied at the Glière State Music School and the Uzbek State Conservatory. Ibrahim earned a Bachelor of Music from Park University’s International Center for Music, where he studied with Martin Storey and Daniel Veis, and he continued, also on full scholarship, at the University of Southern California with Andrew Shulman and Ben Hong. Recently, he finished his Masters degree at the University of Kansas under the tutelage of Hannah Collins and Mark Gibbs. Currently, Sunnat Ibrahim is on the faculty at the Pittsburg State University. He plays on a Marten Cornelissen cello and the Hill bow generously loaned by the Maestro Foundation.